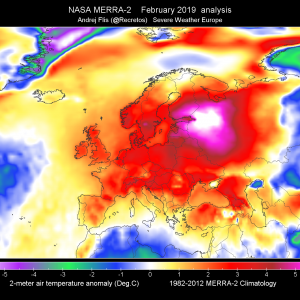 A high pressure system over the Balkan peninsula gradually weakens and moves towards SW Russia while another high pressure system strenghtens over Scandinavia as the deep low over Finland moves east. A deep trough moves across central Europe and N Mediterranean continues E-NE while another trough deepens and moves over western Europe. At the surface, a deep low moves across British Isles towards France and develops a corridor of tight pressure gradient. A MDT risk has been issued for NW France and SW England with threat for extremely severe winds, locally in excess of 120 km/h. A corridor of steep presure gradient establishes between the deep low to the north and the high pressure to the SSW, a potentially damaging windstorm will develop. A large area is likely to be affected with extremely severe winds. 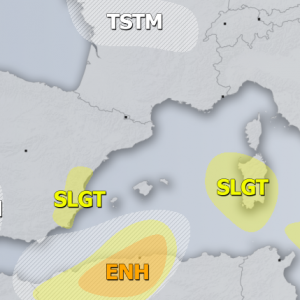 ENH/SLGT risks have been issued around the MDT risk area where lesser extent of severe to extremely severe winds is expected, peak gusts still in excess of 100 km/h. ENH/SLGT risks have been issued for extreme S Norway, extreme N Denmark and parts of the North Sea with threat for severe to extremely severe wind gusts at 90-120 km/h likely. 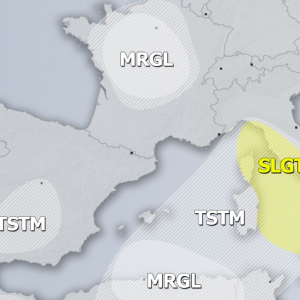 A SLGT risk has been issued for S Italy, S Adriatic, Albania and Montenegro with threat for severe winds, torrential / excessive rainfall and to a lesser extent for tornadoes. 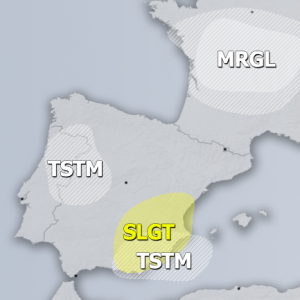 A TSTM+ area has been issued for N Meditteranean where isolated storms with marginal threat for large hail and severe winds are possible. 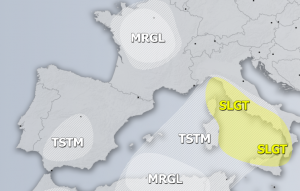 A TSTM risk area has been extended from S British Isles across France into N-CNTRL Mediterranean where storms are expected.